Well, 'the best laid plans ...' as they say. When I first created this blog, I thought I would have the time to post multiple times a week, reviewing comics and providing some commentary. Alas, life seems to have got in the way of so noble a pursuit. So, now that we are 6 months out from my original post, it is time to re-direct and re-focus. My new hope for the blog will be to provide commentary on one title and one character. And, no surprise here, that character will be Supergirl. To start the new focus, I have attached a commission I recently obtained from Jim Mooney, shortly before his passing on last month. Mooney was considered the Supergirl artist of the 60's, drawing most of her back-up adventures in Action comics. His Kara had those big pale blue eyes and exuded the innocence and grace of the Silver Age. About 6 months ago I heard he was still doing commissions. I emailed him and got a nice response. 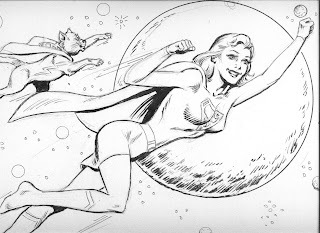 I asked for a shot of Supergirl and Streaky flying as I felt that image would best capture the adventures he drew. To be honest, I gushed like a fanboy ... this guy is a legend in the whole field, let alone his legendary status with Kara. The commission arrived with a nice note at the bottom. The shipment also included a bunch of photostats, prints, and posters of Supergirl as well. Guess my gushing worked! I was sad to read of Mr. Mooney's passing last month, realizing I had never sent him a note to thank him profusely for what has become a cornerstone of my commission collection.